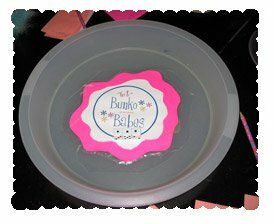 In order to keep the dice from flying all over the table ( a frequent problem for some groups), the Bunko Babes use these fabulous plastic “dice rollers.” Basically, it’s a large flat plastic plate with a raised edge. You can see from the picture that they’ve decorated the dice rollers with their own special logo. You roll your dice into the container and the raised edge keeps the dice contained. Pretty smart, huh? Look for similiar types of containers in dollar stores, decorate, and voila! Instant dice rollers! 1. 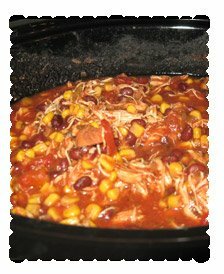 Place first four ingredients in crock pot. 3. 30-60 minutes prior to serving, remove chicken, shred and return to crock pot. 4. 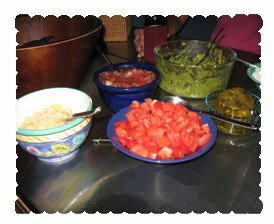 To serve, use chicken mixture as filling inside tortillas. I’ve made this recipe a couple of times and each time, it’s been fabulous!